We’re giving away an iPhone 5s to one lucky reader! The iPhone 5s is the most popular phone in the world and Apples biggest seller and now you can have a chance to win one. Before we get into the details on how to enter we just want to cover some rules: this giveaway is for a brand new 16GB iPhone 5s of the color of your choice and only one entry is allowed per user. 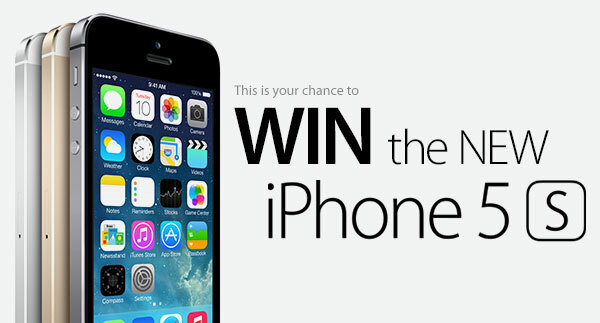 Anyone, of any age, living on planet Earth can enter to win the iPhone 5s. There is absolutely no restriction. If you know how to use a mouse, a trackpad, or a Multi-Touch screen, then consider yourself eligible for this iPhone 5s giveaway. Please only leave one comment per entry. The winner will be selected next Saturday and will be notified via Twitter DM. Pharmacist by day, tech blogger by night. I'm James, author at GeekSays. Would love the iPhone 5s, it would be my first iPhone, not to mention my old Samsung has seen better days ! Hi! I’m Will Luckett on Facebook, and @willbert2016 on Twitter! I am an Apple freak, and I love anything that they produce. I would love to win the 5s because I am still rocking the 3GS! (Great phone btw) I would just love to have the opportunity to win this device! Hello! first of all I would like to thank you for hosting the giveaway and giving us the chance to win an iPhone 5s which is not affordable for anyone including me.The reasons why I should win this iPhone 5s are because, as I mention just now,I couldn’t afford to buy one although it is worth to buy it with it’s advance system and a lot of eye-catching specialties but I am running out of money with my financial issues to pay for university,daily necessities and so on.I also didn’t want to burden my parents into buying me an iPhone which they also have to use their money for paying water,and electricity bill.This is also the reason why I always jealous of my friends ,majority of my friends comes from a rich families in which they could afford to buy one and I always felt left out with my outdated mobile phone 🙁 .Moreover I am starting my first year at university this September and I know how hectic a university students is with assignments given and a projects to do,not to forget about the tests and exams!,this iPhone could give me a time to sort my schedules as well as relieving stresses.It have a lot of fantastic application from education to games and music in which this became my main reason to have an iPhone and this is why I said that it could manage my time and relive my stress! To add to it,my current phone is so outdated that almost all application that I need to download is not supported and I think you could feel how frustrated I am!Hopefully with this giveaway I could stand a chance to win this iPhone and let myself out of this misery ^^’ I also have no doubt that this iPhone could help me in ace-ing my pharmacy course since it have a lot of brilliant applications related to drugs and medicines, thus I really needed this iPhone,it will be like killing two birds with one stones! lastly I want to give you many many many thanks once again. I don’t have any single reason why should I have an iPhone 5s. It’s simply that easy that why you need air. I have always been a fan of iPhone, whether it’s the elegant iOS 7, the security, the apps they provide, the crystal clear camera. I wanted to buy an iPhone from last 6 months, its when iPhone 5s released. I didn’t have sufficient money so I bought a second handed iPhone 4s and I bricked it while jailbreaking on iOS 7 few days ago. My bad luck it was that I couldn’t make it. It will be grateful, if you choose me. Thanks. Hey I would love to get my hands on this IPhone 5s. I am a die hard apple fan and been wanting to upgrade from my IPhone 5 a longtime now but money is alway an issue once you are a college student. If I get this phone I will make a sweet video review and thank Geeksays for everthing. I would love to win this because my phone is kinda out dated.